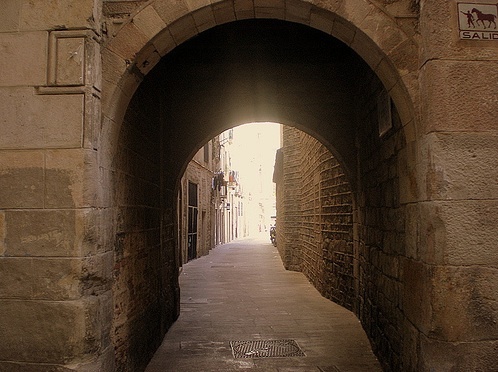 In 1907, the new Via Laietana cut the Barri Gòtic off from its medieval business end, the Barri de Sant Pere (home to Barcelona’s medieval textile manufacturers, surrounding the once-important church of the same name), and La Ribera, the old maritime and business district. No one seems to quite agree where the neighbourhood boundaries begin and end but traditionally it's all La Ribera—although the gentrified southern end prefers to be called El Born. Back then, when Barceloneta was just a slip of sand and the sea washed up to what is now Avinguda Marquès de l’Argentera, there was a constant bustle as goods were ferried to and from waiting ships. When the Ramblas was still a sewer, the Passeig del Born was the throbbing heart of Barcelona, surrounded by artisans and their shops who worshipped at the beautiful church of Santa Maria del Mar, while tycoons in their grand Gothic palaces along Carrer Montcada wheeled and dealed in the Llotja, the hub of western Mediterranean commerce in the 13th and 14th centuries. Then came the lean centuries, and after them the traumatic amputation of half of La Ribera for the Ciutadella in the early 1700s. And when that detested fortress finally came down, Barcelona spread its wings and flowed into the Eixample, taking most of La Ribera’s trade and all its better-off citizens with it. Left behind, the neighbourhood did get a waft of Modernista fairy dust in the incomparable Palau de la Música Catalana and in the Parc de la Ciutadella, the stage for the city's first world's fair in 1888 and now home to the zoo among other things. After a long decline, the return to fashion was first heralded in 1963 with the opening of the Museu Picasso, followed by the restoration of the Gothic palaces along Carrer Montcada; for dessert, you can learn all about chocolate. Today La Ribera's intimate shop, bar and restaurant-filled streets, especially around the Born, have an edgy buzz—unlike the tourist thonged Barri Gòtic, it feels like a part of the medieval city that that the locals have for the most part kept for themselves.